The southern chinch bug, Blissus insularis, is one of the most important insect pests of St. Augustine grass in Austin Texas. 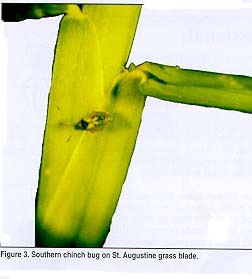 Although most damaging in Gulf Coast regions and in the southern half of the state, chinch bugs can be a problem anywhere St. Augustine is grown. Chinch bugs prefer hot, dry environments. Dry weather enhances survival of chinch bug nymphs and eggs by reducing the incidence of disease. 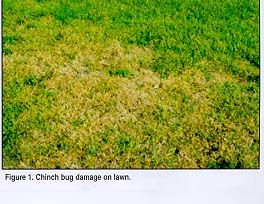 Also, drought-stressed lawns are more susceptible to chinch bug injury, therefore, proper irrigation is crucial to Chinch bug population control. 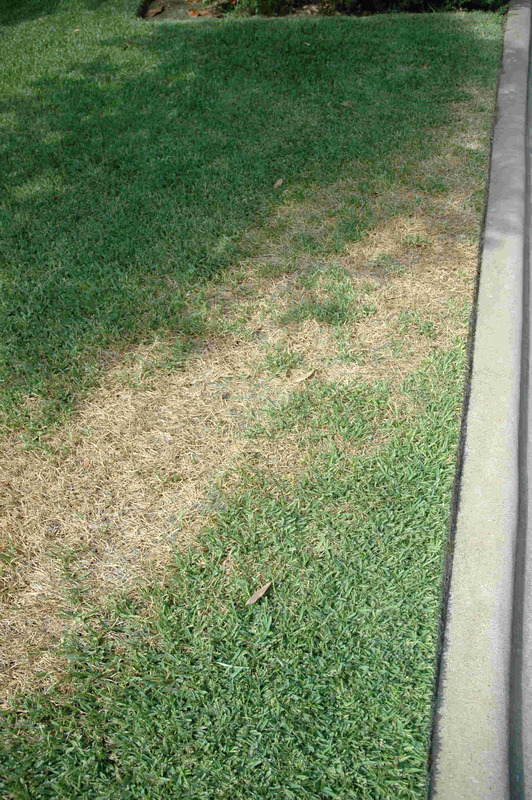 Although the southern chinch bug is a serious pest in St. Augustine grass lawns, it will feed on zoysia grass, centipede grass, bahia grass, or bermuda grass. The common chinch bug, Blissus luecopterus, is a closely-related species that is a pest of grain crops in Texas and throughout the Midwest. 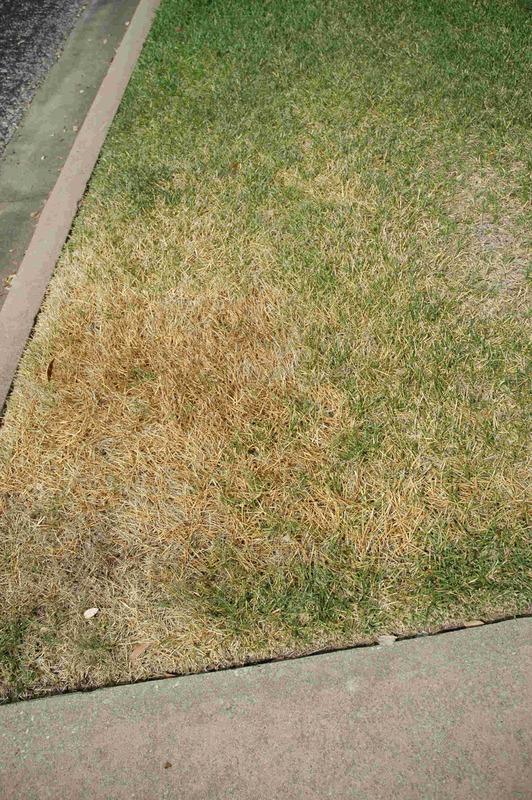 This species also occasionally damages turfgrass and may be responsible for infrequent reports of chinch bugs in bermuda grass, fescue, and zoysia grass lawns. When thatch exceeds 1 inch in thickness, it may be necessary to have your lawn �vertically mowed.� Vertical mowing (a method of physically removing thatch) can be performed by a professional lawn maintenance company or by doing it yourself. 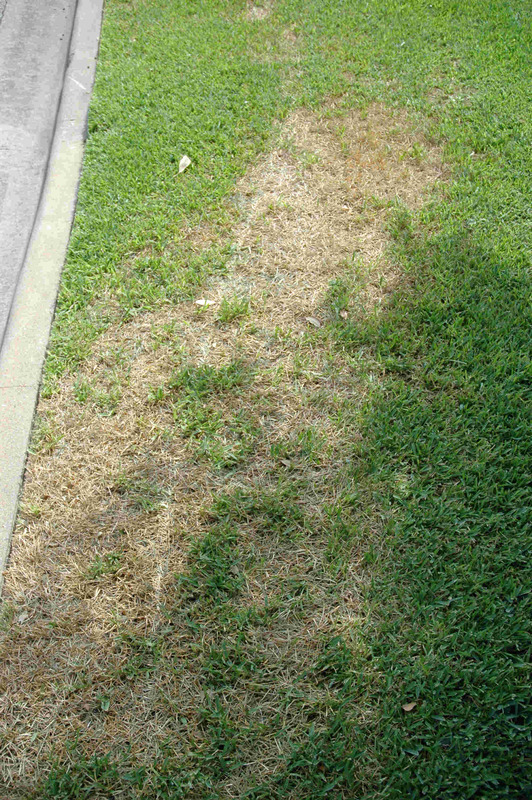 Vertical mowing can temporarily harm your lawn�s appearance because it destroys the tightly woven stolon system of St. Augustinegrass. Vertical mowers can be obtained through many equipment rental stores. 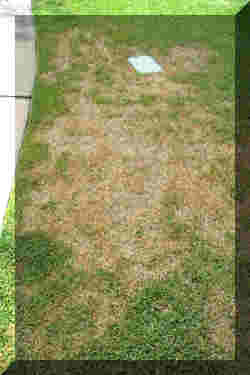 St. Augustine grass lawns should be watched closely during the summer for signs of drought stress. 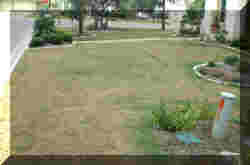 The lawn should be watered immediately when edges of grass blades begin to curl, grass fails to spring back quickly when walked on, or the turf takes on a dull bluish-gray color. 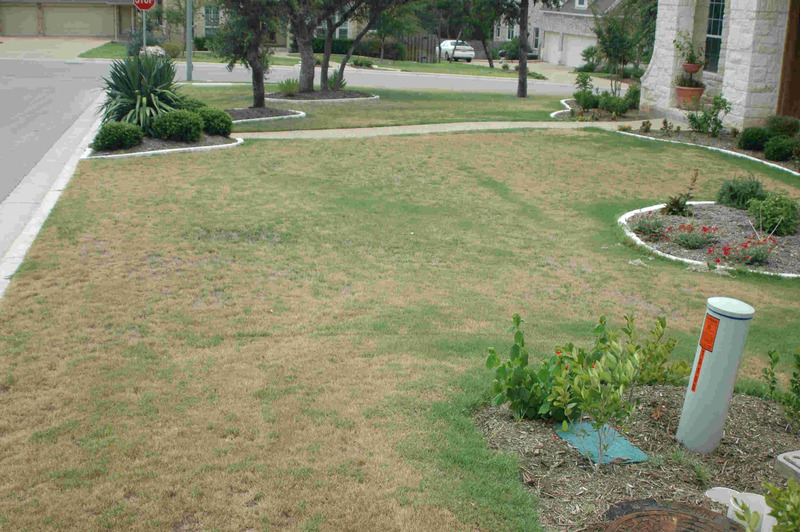 Due to the variety of soil types and depths in Texas, the amount of water needed will vary. 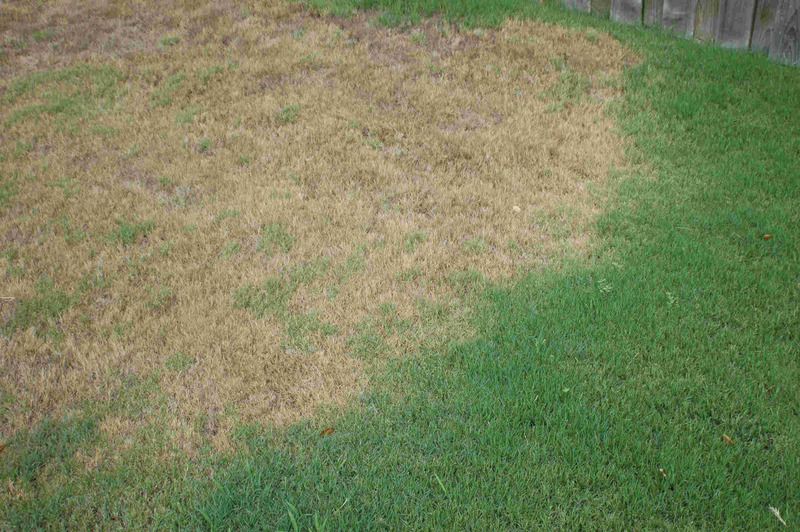 The most commonly planted St. Augustine-grass varieties (including �Texas common� and �Raleigh�) are highly susceptible to chinch bug attack; however, research has identified several resistant types. The varieties �Floratam�, �Floralawn�, and �Floratine� show varying degrees of resistance to feeding by chinch bugs. �Floratam�, however, is the only variety that is commonly sold in Texas. �Floratam� generally provides a high level of resistance to both chinch bugs and St. Augustine decline (SAD), a virus disease; however, it should be planted only in the southern half of the Texas because of its lack of cold-hardiness. Residents of counties north of Houston and San Antonio should check with their local county Extension office to determine whether �Floratam� is appropriate for their area. Products containing diazinon, chlorpyrifos (Dursban�), or acephate (Orthene�) are suggested for homeowner applications. 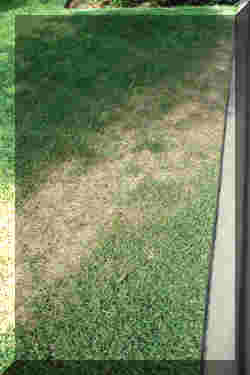 Chinch bugs have been reported with resistance to the above products in some areas of Florida; however, this has not been apparent in Texas. Where any of these products fail to provide control, apply a synthetic pyrethroid such as permethrin (e.g., Spectracide� Liquid Insecticide Spray). 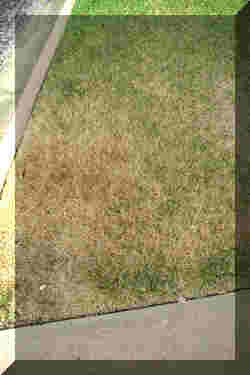 An approximate action threshold (level at which damage begins to appear) for chinch bugs on susceptible St. Augustine grass varieties, (e.g., �common� and �Raleigh�) is 20 to 25 chinch bugs per square foot. An alternative sampling method to simply parting the grass and looking for the insects is the flotation method. A coffee can (with the top and bottom lids removed) should be pushed into the ground with a twisting motion. Use a knife, if necessary, to cut the grass around the rim. Fill the can with water for about 10 minutes and check for chinch bugs as they float to the surface. Action thresholds for samples taken with 4-inch and 6-inch diameter coffee cans are an average of two, and four to five chinch bugs per sample, respectively. 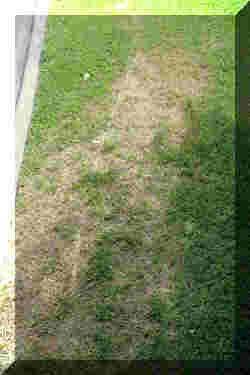 Several samples should be taken from different locations in the damaged (not dead) grass. Big-eyed bugs closely resemble, and often are mistaken for, chinch bugs. Big-eyed bugs are beneficial predators that kill chinch bugs and many other pests. Although similar in size to chinch bugs, big-eyed bugs have large, protruding eyes and a head at least as wide as the thorax (the leg-bearing part of the body). Chinch bugs have small heads (narrower than the thorax); eyes are small in proportion to the head; and their bodies are more slender. Big-eyed bugs do not have the distinctive white wings with black triangular marks that chinch bugs have. Additional labeled pesticides for professionals include bendiocarb (Ficam�, Turcam�), bifenthrin (Talstar�), ethoprop (Mocap�, golf courses only), fonofos (Crusade�, Mainstay�), imidacloprid (Merit�), isofenphos (Oftanol�), lambda-cyhalothrin (Scimitar�*, Battle�*), and permethrin (Astro�). Resistance of chinch bugs to organo-phosphate insecticides has been reported in other states. In case of suspected resistance, rotate to another class of insecticide. 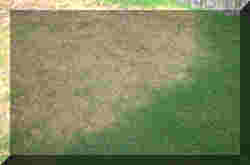 Note that diazinon may not be applied to golf courses or sod farms. Use of surfactants in spray solutions may enhance control, especially in turf with heavy thatch. Regular, light top-dressing of turfgrass with compost, or soil similar to the existing soil, can help lessen thatch problems. Proper irrigation is crucial to Chinch bug population control. Chinch bugs prefer hot, dry environments. Dry weather enhances survival of chinch bug nymphs and eggs by reducing the incidence of disease. 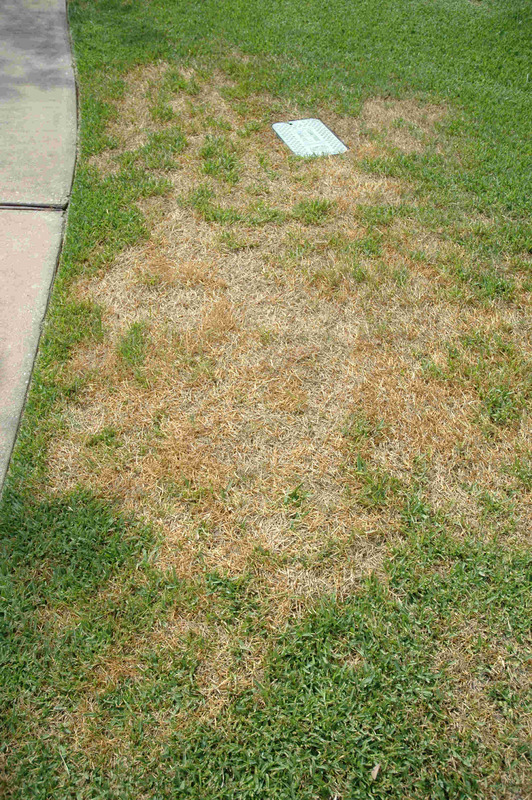 Also, drought-stressed lawns are more susceptible to chinch bug injury.